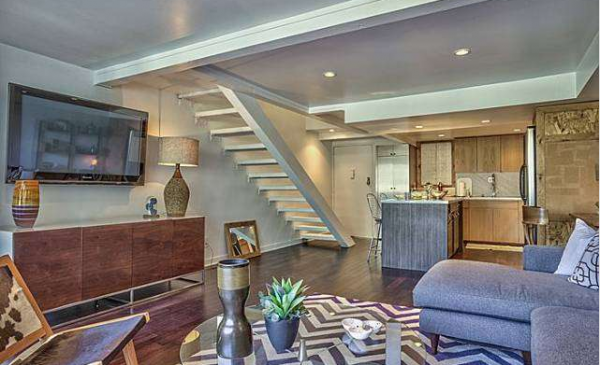 Look around Los Angeles all you want, but you will be hard-pressed to find any kind of architectural home (or condo) anywhere close to the $439,000 asking price of 1701 Clinton Street #325. 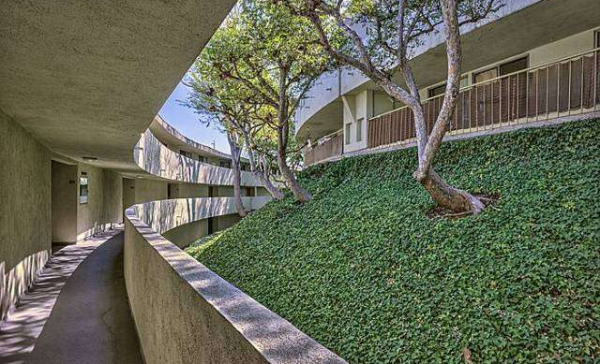 Perched way up high with a mighty view of Echo Park Lake, this crescent shaped complex known as Lago Vista was built by Allyn E. Morris Architecture in 1973 and remains an iconic visage of Echo Park. 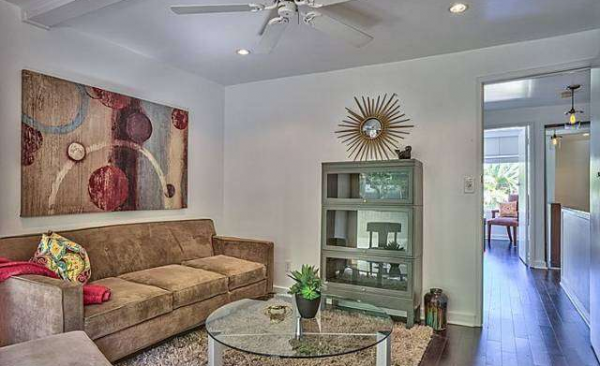 This enticing 2 bedrooms, 1 bath townhouse-style condo features dark wood floors throughout, along with an updated kitchen that includes stainless steel appliances, marble countertops, and sleek new wood cabinets. You know, the usual. While its footprint is a modest 843 square feet, the space is well utilized. And, with a wide wraparound balcony facing the lake, you not only get a great place to hang out, but a ton of natural light, and some much-welcomed privacy. Not only does the kitchen island provide additional storage, but the second floor hallway features both a closet and a recently added built-in bureau. 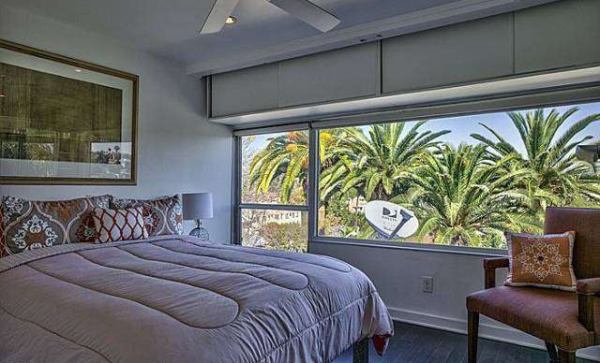 Just like downstairs, the master bedroom features a wraparound view of the lake. It also includes additional built-in overhead storage, but just be careful opening as things may have shifted during take off and landing. The second bedroom is also large enough for use as a healthy-sized office or den. 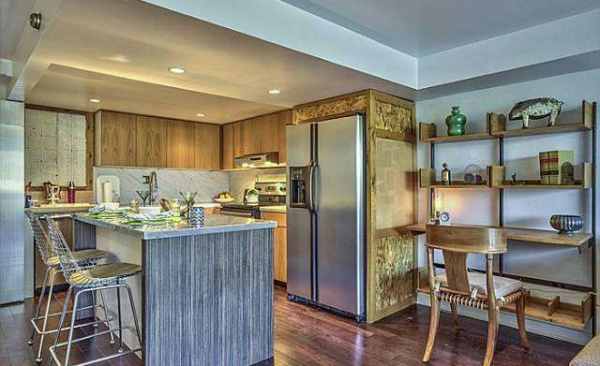 Located at the end of Clinton Street, for a condo, this unit offers a fair amount of solitude. With other features including a hidden washer/dryer unit (these are rare for the Lago Vista complex! 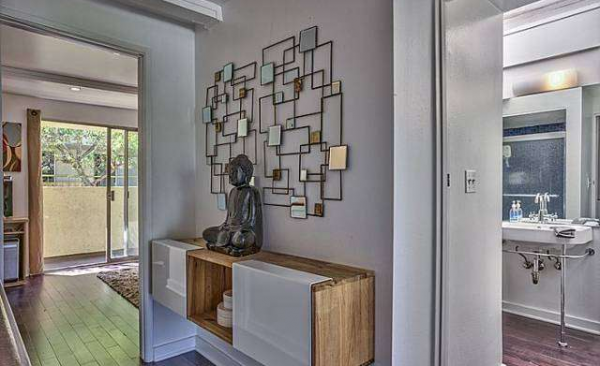 ), sky light in the bathroom, recessed lighting throughout, and proximity to great neighborhood shops and restaurants on Sunset Blvd., this is a great buy. 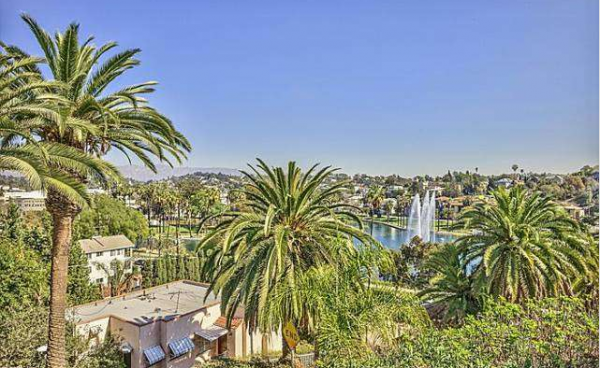 John Abreu of Berkshire Hathaway Home Services California has the listing.